I have been inspired by the Vintage Vixen's recent posts where she is all dolled up in pink here and here, and the amazing pink "Barbie" print fabric she found. Pink is a colour that I hadn't had much of a relationship with until this past year when the odd pink item of clothing made its way into the fortress of black, grey and red that was my closet. By the time I brought home the Shoes of Total Awesomeness, pink seemed to have established a foothold in my wardrobe. I picked up this fuschia linen tunic from the 70% off rack at From Mars last year - it was the age-old case of "too good a deal to leave behind" but I couldn't figure out how to style it. It was too short to wear as a dress, and kind of boxy. Pink and green has always been one of my favourite colour combinations so I thought the green obi belt I purchased on Etsy and a long skirt might be the solution. Not bad, I think. A friend gave me this pink and white bit of 70's polyester goodness, which kind of reminded me of tops that my mother used to wear. I decided to banish any mother-related associations by pairing it with funky pants, Docs and head scarf, and a cheeky attitude. Pink conjures up images of childhood, princesses and Barbies. I loved my Barbie doll that I had in the 60's, who had a red bubble hair cut. I guess I didn't love her so much as I loved her clothes, and I was able to live out my own wardrobe fantasies through her. I kept her, even though her fingernails had been chewed off and her makeup faded, and about a dozen years ago, I had an opportunity to be immortalized with her when a friend photographed us for an exhibit of photos of Londoners with their favourite toys. Do you still have any of the dolls from your childhood, or ones you've acquired as an adult? I really like both your outfits in this post. How fabulous to appear in an exhibition with your Barbie. I think I have a doll made for me tucked away somewhere and you have inspired me to go and hunt it out. 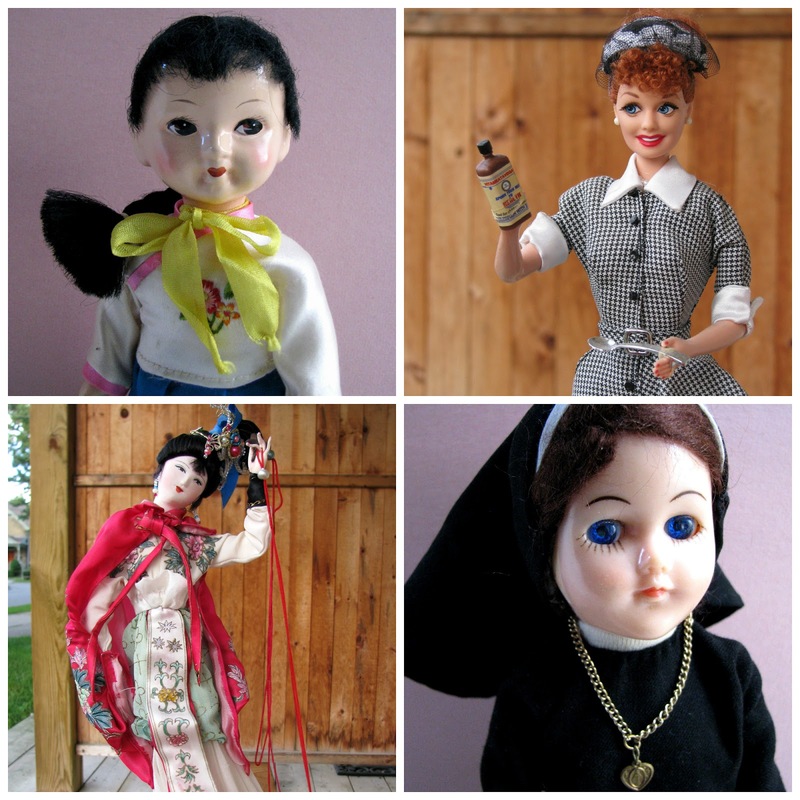 I confess I have a few Barbie and Sindy dolls, and even some of the clothes I made for them when I was a child. One day I will photograph them. I still have boxes of my Barbie dolls and boxes of their clothes and shoes. I was a huge collector as a kid. 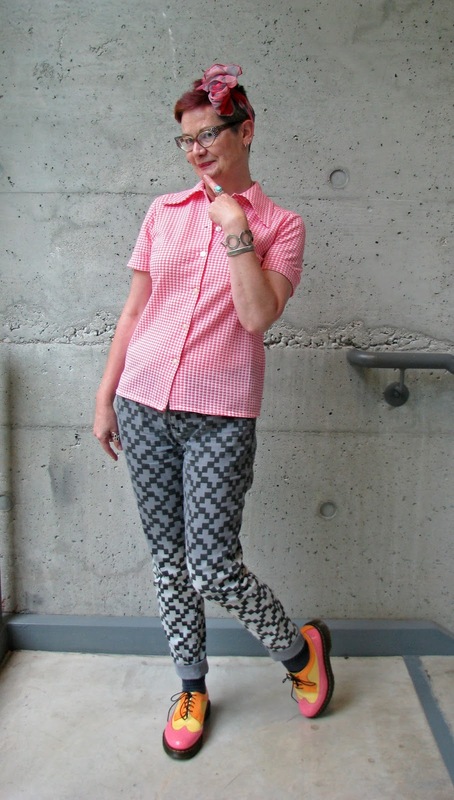 You've styled that pink tunic brilliantly, looks fabulous! And I love the picture of you and Barbie! I think my first Barbie kick-started my own fascination with fashion and style. Do I have dolls? Who me? You should check out my Weird Doll Wednesday posts. Your dolls are awesome. Love the first outfit. I looks like something Issey Miyake designed. I adore your first outfit - every bit of it! The tunic, the asymmetrical obi, the skirt, the sandals. If I could pick one blogger look to steal and copy, this is it! I'm going to start looking. Barbies! I drooled over the Sears Christmas catalog in 1963 when all the Barbies were in it. My mom bought me a Midge instead because she thought Barbie was too superficial. But the next year I got the New Dream House, and that was awesome! All my friends had Barbies. I actually bought a new version of the 1962 classic Barbie with brunette bubble hairdo a couple of years ago. And I was so excited when I got it!! I love the photo of you with your Barbie and twirly dress! What a treasure. Both the gorgeous artsy-elegant and the vintage-quirky looks suit you well. You too on the pink creeping in! (I'm letting it do its thing but as yet giving it the side-eye, what is WITH that????) Thank you Shelley for the story of your dear Barbie and the magical photo and showing us some of your current collection - I find this post moving. The green with the tunic works! Oh yes. That's such a structured, bold look. And then, pow, you pop up in another fun de-mommified look with that fantastic blouse. Both work so well. The photo is definitely a keeper, timeless. Really beautiful. Thanks for sharing that here. I didn't play with dolls much. I would rather muck about in the mud with sticks "baking" but mostly making things that fell apart immediately. You have a wonderful collection. Nun things freak me out - that's why I am fascinated by them. pretty in pink. add more to your wardrobe it really suits you . you look great. I love that photo of you and Barbie - she's gorgeous and I think you are even more beautiful now. I'm thrilled to have inspired you, I adore you in pink, definitely a futuristic Barbie in the first picture and definitely not mumsy in the slightest in the second. What a wonderful photo of you with the Barbie--I love the swirl of your skirt and the expression on your face. I know that my own face has settled into a bit of a frown and at night, when I cannot sleep, I pass the time by trying to relax those facial muscles. Here's to pink. That photo of you and Barbie is nothing short of magical. I love how uninhibited you look, totally in that moment! You should wear pink more it suits you! I love the first dress with that cool belt! Your dolls are crazy good too, the nun I love. I have quite a few dolls and they are all weird or adorable. love your fuchsia linen tunic, its fabulous shape and color, and how you're sporting it with your usual sassiness!, brilliant! and you look so cute wearing your funky pants and The Shoes!, cute! I'm admiring so much that photograph, so evocative and whimsical!, and your dolls are awesome! You look wonderful in pink--especially the bold fuschia and the bubblegum shade. I am in love with the second outfit with THOSEHOES!!! You nhave some cool dolls!! Is it okay if I knock off that first look? The layers and asymmetry are calling my name. I'll need some sort of sleeve, but I think I can figure that out. The sandals are perfect to complete the look. Although I probably wouldn't wear it myself, I adore the second outfit too. I can see it on one of my best friends. :-) Dolls are popping up everywhere! Somewhere in the bowels of my house I have a doll that I made from fabric scraps when I was maybe 6 years old. Guess I haven't changed too much, huh. Pink may be new for you, but I think it's a color that works! 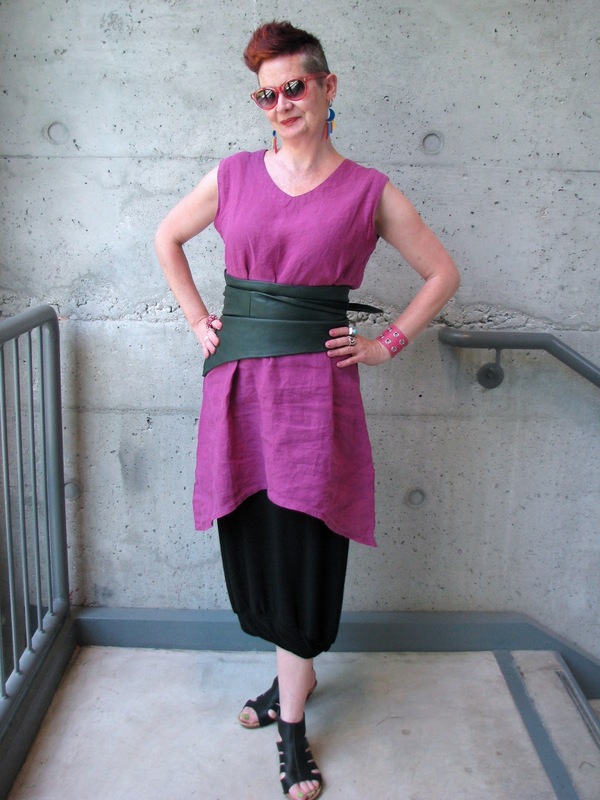 The linen tunic with leather obi has the perfect amount of 'edge' and the next photo is the other end of the continuum. So much versatility and diversity in one post, but both look fabulous on you. You look like a dancer in the photo of 12 years ago. You're a doll! As you know, I have struggled to come to terms with pink, but am increasingly enjoying wearing it - and I think you can wear it well too! If you do it right - and you have - it needn't look overly girly, your first outfit is strikingly grown up and stylish, I love it. And the second is all about having fun with fashion, taking a "mumsy" blouse and making an outfit which is the opposite of all those stereotypes, while giving a knowing nod to them at the same time. Clever, Shelley, very clever! That exhibition photo is a keeper! It would be my fav too. I hate to admit I have begun collecting Barbies and Madam Alexander dolls. They make appearances in my specialized blog posts. 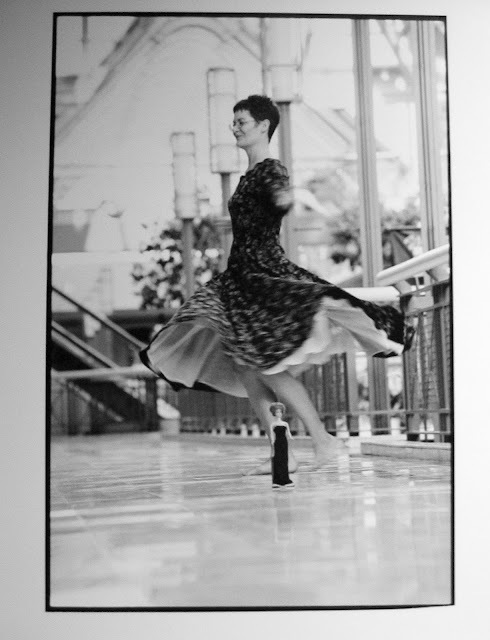 Love the exhibition photo. I have that particular Barbie too. She came wearing a red swimsuit but love the long gown in your picture. I just love dolls and so enjoy seeing the ones in your collection. Thanks for sharing. You have such great style!